This was an excellent play and I would highly recommend to those out there who feel intimidated by Shakespeare. I think Romeo and Juliet is a great introduction to his style and it is fairly easy to understand and translate certain words or phrases. Set in Verona, this play follows the Capulet and Montague families. An initial scene that has a fight breaking out between the two families servants, we hear about how much the two families loathe each other. What would be sweeter if then the children of both men would somehow meet up and fall in love with each other. That is the plot of Romeo and Juliet, and Shakespeare manages to have moments that will make you laugh, swoon (the dialogue between Romeo and Juliet is wonderful) and then cry. We get the very interesting characters of Romeo and Juliet and I thought that Shakespeare did a great job of making them both seem like teenagers in their interactions with each other. Who else but teenagers would fall in love with each other after a single night, and then say let's totally run off and be married to each other. Frankly, I was surprised how faithful Romeo was throughout this play since he did come to a ball at the Capulet's home in order to see Rosaline (she was a niece of Capulet) and apparently not getting his love reciprocated has made Romeo depressed. I have to say though, that most people are going to love how Romeo and Juliet speak to one another and their love for each other. I still say that Jane Austen's letter that Captain Wentworth writes to Anne Elliot (Persuasion) is still hands down the most romantic and heart thumping thing I have read in print. I would say my only quibble about this entire play is how in the world did Romeo and Juilet never lay eyes on one another? I would figure if your families hate and want to kill each other so much, you would know what all members of said family looks like. Other than that, I loved every part of this play. In the end, the two families realize that they alone are to blame for what befell their two children. Keeping up unending animosity is what led their kids to think that faking their deaths would be a good idea. 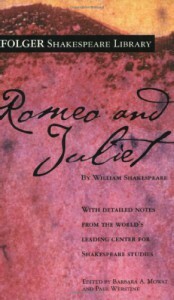 .For never was a story of more woe than this of Juliet and her Romeo.